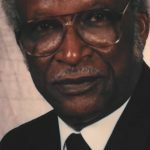 Willie F. Newby 96 went to eternal rest on Saturday, April 6, 2019. Funeral Services will 12 Noon Saturday, April 13, 2019 at Greater Salem Baptist Church, 1009 West Chestnut Street. Burial will be in Highland Memory Gardens with Military Honors.